December 22, 2015 May 23, 2017 by Venky. 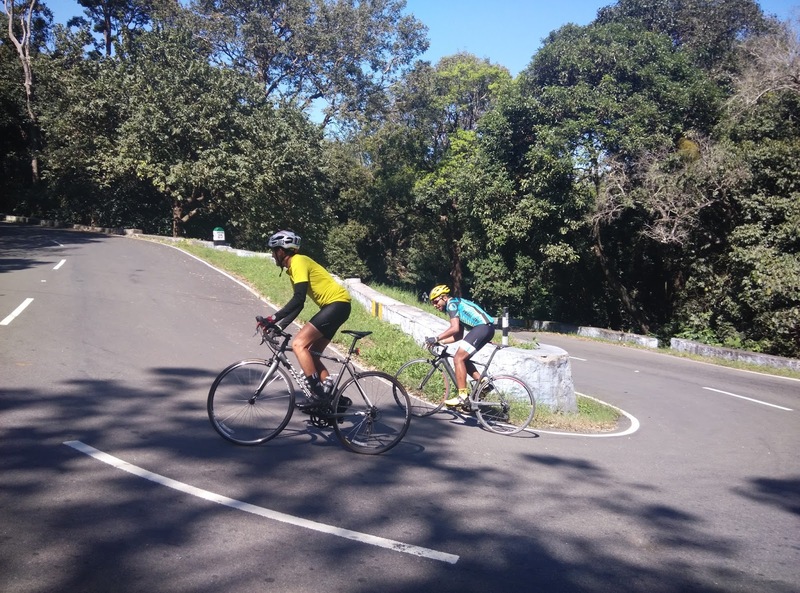 The ride to Valparai on TFN Day 7 today is the last tough ride for the tour since tomorrow’s downhill ride to Pollachi is more of a procession stage ending with the presentation ceremony. Today also brings the last competitive segment of the tour this year that decides the podium places for all the categories. The first 20km of our ride out of our hotel in Palakkad retraces the route we took yesterday from Ooty. It was a slight uphill with headwinds. We realized why we were that fast yesterday while reaching Palakkad. We wanted to take it easy till SS2 where the last competitive segment starts. We were going at a pace that allowed even a kid on his single speed MTB to give us company for a while. Once we went past Meenakshipuram, the scenic beauty went up a notch. The stretch is aptly named Sundarapuram and it was lined with trees on both sides that offered us a tunnel view and cool shade. After that we went through Annamalai tiger reserve, Pollachi range for a bit. 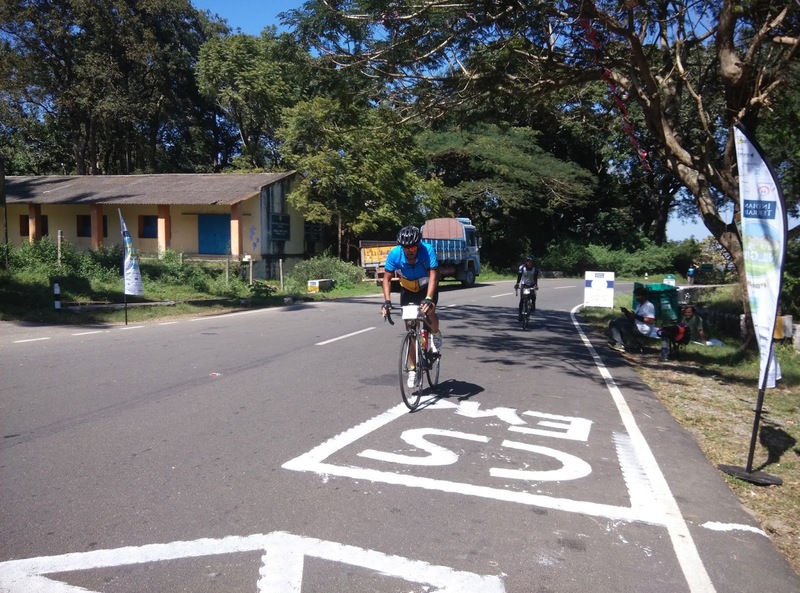 We reached the support station two near Aliyar water reservoir check post(68km mark) quite early. Nils and others who got there an hour back were still waiting there. They could not start the CS as the volunteers were apparently showing permission letters to forest officials so that they wouldn’t stop us from riding the climb which falls under forest zone. While we waited there, we bought fresh honey from a mobile honey vendor who was squeezing the honey out of honey combs right there. As the pre-race nutrition goes, honey dipped bananas is not that bad I think. After a few minutes of resting under the shade, we got a green signal to start the CS. I was one of the first few riders who started riding the competitive section. After wasting a few seconds trying to cleat-in, I was off. The first 2.5km of the 11.7km race segment is the flat approach to the actual climb. I started out in the big ring and was going at a decent pace. I didn’t want to start out too hard and suffer on the later part of the climb. So, I was watching the power numbers and was pacing myself. I had an aggressive goal to begin with but I also wanted to back off a bit if it felt too difficult. Last year, I took a little over 42mins for the same section(this year’s segment is slightly longer). So, I was aiming to go sub-40 min for the section. More than the time target I was more focused on my power target and was hoping if I managed to maintain that power for the duration of the climb, I will reach my time target as well. I was maintaining the power well until I hit the hill. I decided to keep going in the big ring on the climb as well. I have not been training for spinning up the hills and hence decided to use low cadence muscular endurance way to maintain power. After two days of living on curd rice and avoiding all the mutton, desserts and all the great food the Ooty hotel had to offer, my tummy troubles calmed down and I was feeling a bit better today. 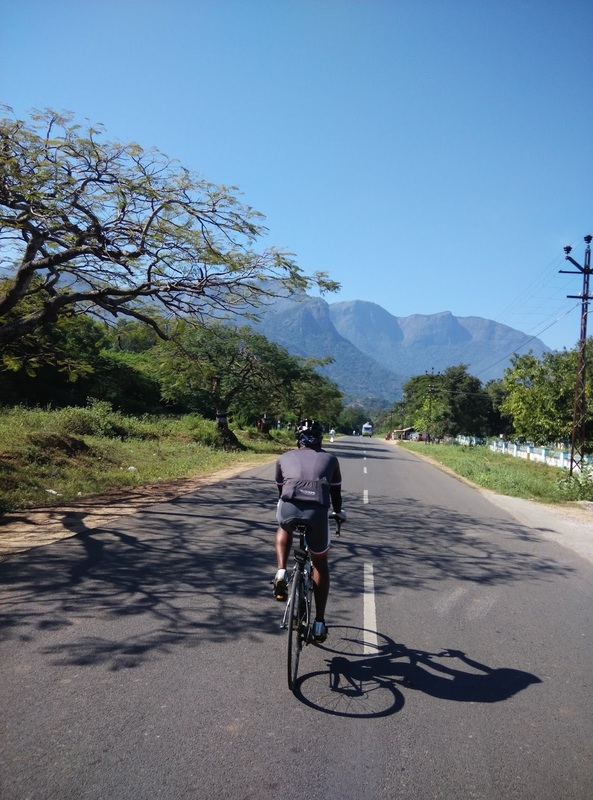 Yesterday’s ride to Palakkad after the rest day in Ooty also helped to loosen the muscles and remove the soreness and pain in the legs from the Kalahatty climb. I was feeling relatively stronger and the legs were moving alright. The numbers were looking good. But, I knew it is a long climb and it is important to keep focus on pacing. I was focusing on my pacing although the scenic beauty of the valley, with the reservoir down below was amazing and quite distracting. It was hot and the sweat began to pour down in streams. I opened the jersey halfway hoping to cool the body by allowing the breeze in. Nils caught and passed me as if I was standing still. As he passed me he said, ‘Come on Venky. Last one.’ Yes, one last push. Enough suffering for this year, I thought. 20 mins into the ride, the energy began to flag a bit and I quickly downed a gel and gulped some water. I caught up with Richard and went past him. The heart rate was in the red zone but it was just about a matter of few more minutes of suffering for the tour. It is about retaining the Blue Jersey. If that is not motivation enough for me, nothing else will be. So, I continued to suffer and continued to push as hard as I could. Vivek crossing the finish line in the CS! Ready to fall off the bike, I crossed the line after about 41mins. It was almost 2mins improvement from last year. I have to wait and see when they announce the results if I am able to keep the blue jersey for masters. Results will be announced during the presentation ceremony after the ride tomorrow. The Amazing Beauty of Valparai! After the CS ended at Attakatti, a few of us quickly jumped into the ‘Hotel New Restaurent’. They served hot rice and sambar with a few curries and delicious fried fish. It was a super recovery food after the race. The delicious meal after the CS! 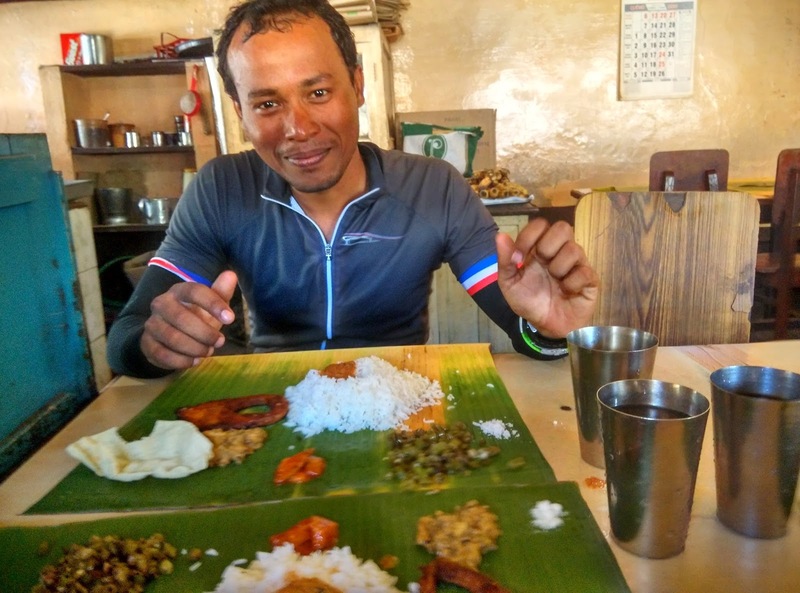 Once our bellies were full, we still had to ride some 15km climb and 10km downhill to reach Valparai. We quickly got onto our bikes and started moving slowly. Just one of the many amazing views! The scenic beauty of the place just blew our minds and we ended up stopping at almost every turn to take lots of photos to take the memories of this amazing climb with us. It was easily one of the most scenic climbs we have ever ridden in. The 25km climb is simply amazing! How Will You Spend Your 70th Birthday!? Russell Bell the British rider from Goa signed up for TFN and sent in his profile for the registration. When we saw him ride on the first day, we knew he was an experienced rider and wondered how old he was. With a sheepish grin, he revealed that he was 69 and he had to put his age as 52 and send in an old photo of himself so that the TFN organizers wouldn’t reject his registration request. The veteran with a 40 year experience in riding bikes started cycling when he was 30 years old and worked up to Cat2 by the time he was 33 years old. He later moved to Goa and has been living there for the last 20 years. The way he still rides the bike is pretty inspiring and he stands second in 45Plus category. Russell Bell and Aijajj Ahmed, 2nd and 3rd in 45Plus Category! He turned 70 today and we celebrated his birthday with a big cake from TFN. 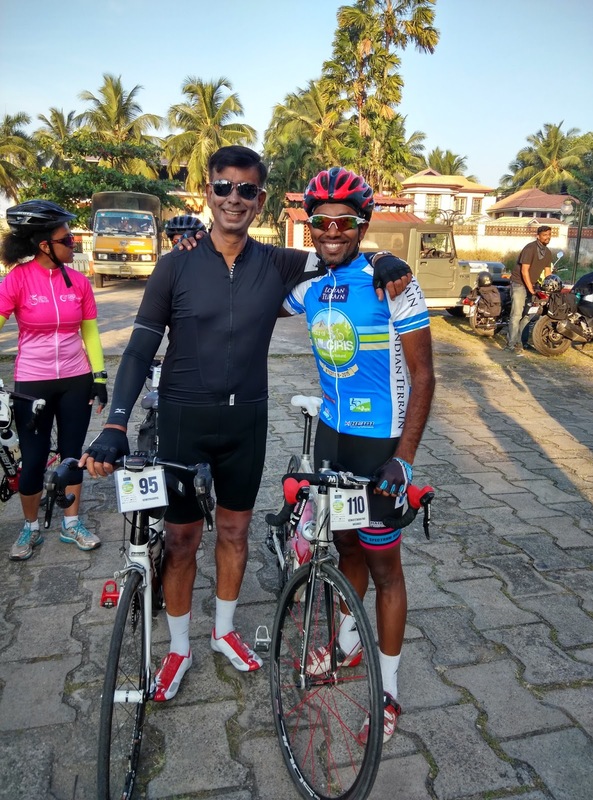 His close competition in 45plus category was the 52 year old runner, Aijaj Ahmed, who started cycling early this year as running was hurting his knees. This long time runner works in an offshore oil rig as an engineer and is away for a month and is at home a month when he gets to ride. Both the riders are such endearing and joyful characters and excellent riders. Tomorrow’s 75km to Pollachi is more of a relaxed downhill ride after the initial 15km of climb. At Pollachi we will clean up after the ride and have presentation ceremony and then head to Bangalore by bus. Can not believe the tour already coming to an end. Looking forward to the results tomorrow and hoping that I’m able to retain my blue jersey. More photos from the day can be seen here. 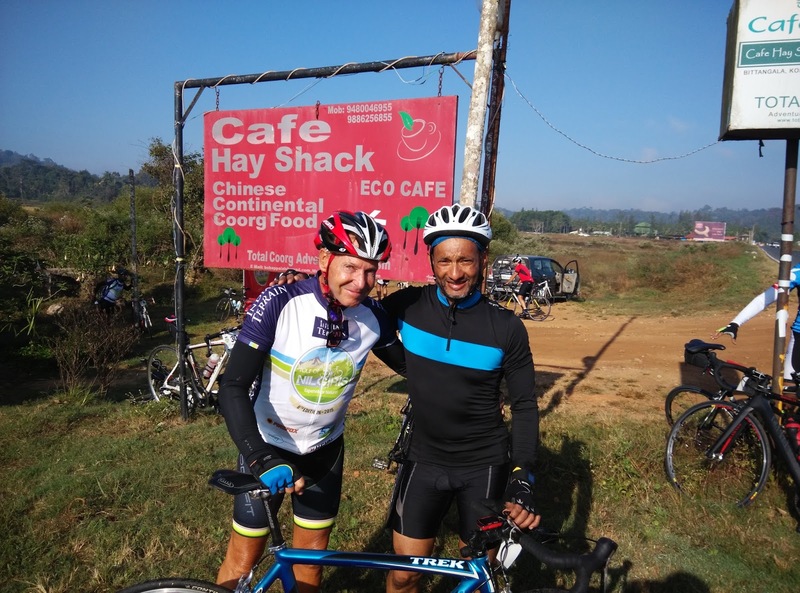 Previous Indian Terrain Tour of Nilgiris 2015 – Day 6! Ooty to Palakkad!